Welcome to the True Grit family. 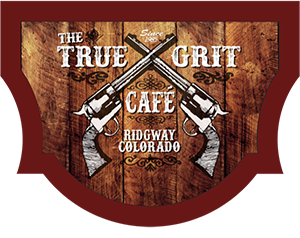 I’m Tammee, originally from Florida and I’ve owned the True Grit Cafe since 1996. I believe in Southern Hospitality and want you to feel that coming into the restaurant is like coming into my home. Don was born and raised just up the road in Montrose, Colorado. He is a born and bred cowboy with cowboy ideals. We are both very patriotic with great appreciation for all the sacrifices given by our men and women of the military (Don has 2 boys that are military with one still active). Both of us have servants’ hearts and love to take care of folks, especially our youth, supporting them as much as possible by participating in community programs including Ridgway Athletics, Weehawken Arts, and Young Life. We love that we get to live in a place that is so rich in ranching, railroad and mining history. So much to learn about the past that still impacts the present! Oh, and we are huge John Wayne fans! !